Monday Motivation: Running is Fun | Fit Girl. Happy Girl. Sometimes we forget that running is actually really fun! I was reminded of this when I had an utterly fantastic long run last Saturday. I felt so happy as I was running and I felt like I could go on forever. It was the best feeling I’ve had in a long time. Then I saw this graphic on Pinterest and I couldn’t help but share it. I remember running around outside when I was a little kid and there was nothing better. Especially in the fall, my little sister and I would run around our back yard through the leaves and we were just in complete bliss. 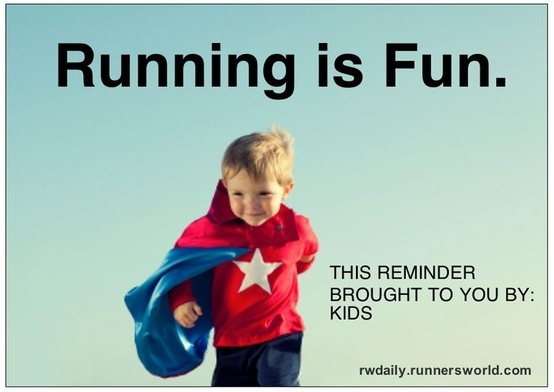 It’s important to remember that running really is fun. Although we may train and really push ourselves to our limits, never forget why you fell in love with running in the first place. Run happy! I love this! Kids love to run, we have a lot to learn from these little guys. Even better, watch their beautiful form as they run around barefoot! So true! They really do have the best form. If only it stuck for the rest of their lives! When I was a kid it almost felt like flying at times. No lead legs back then!